Dedicated to performing the most innovative, exciting, and important works of the 20th and 21st Centuries, the Frontiers New Music Ensemble is the leading contemporary ensemble in Oklahoma. 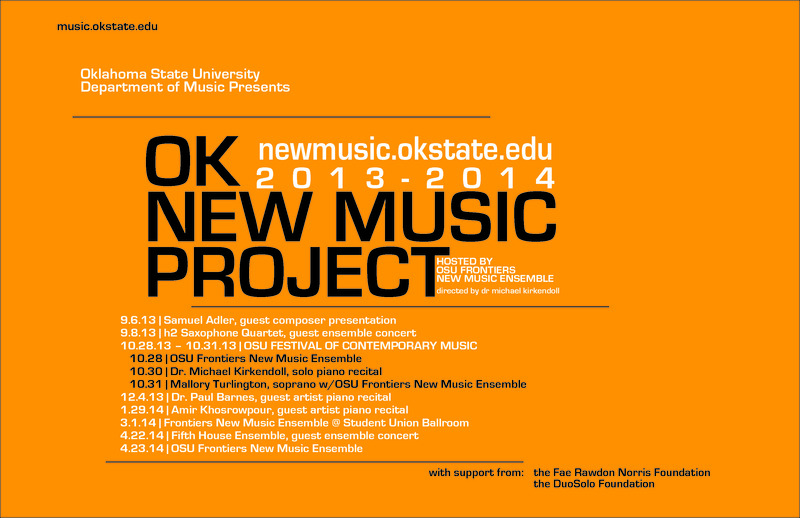 The Frontiers New Music Ensemble annualy hosts the OSU Festival of Contemporary Music, and beginning in 2013, the OK New Music Project. These programs bring leading composers and new-music perfor.mers to Oklahoma for cutting-edge concerts, workshops, and collaborations. 2/20/14: The OK New Music Project continues with the OSU Frontiers New Music Ensemble performing a program entitled "Infinite Music" on March 1 at 7:30pm in the OSU Student Union Ballroom. The program includes Steve Reich's Six Marimbas, I Presagi by Giacinto Scelsi, and Messiaen's monumental Quartet for the End of Time. 1/23/14: The OK New Music Project is excited to welcome pianist Amir Khosrowpour for a recital, masterclass, and improvisation workshop January 30-31, 2014. Mr. Khosrowpour's program will consist of works by living composers (including John Adams' Phrygian Gates) as well as several improvisations. In addition, there will be a masterclass for OSU piano majors from 3:00-4:30 on Friday, January 31, followed by an improvisation workshop from 4:45-6:00. All events will be held in the Seretean Center for the Performing Arts Concert Hall and are free and open to the public. More information about Amir can be found on his website www.amirpiano.com. 10/25/13: The OSU Festival of Contemporary Music kicks off next week! performing Crumb's Makrokosmos II, and music by Bruno Mantovani, David Rakowski, and Giacinto Scelsi. performing the world premiere of Radiant Nameless by Jason Charney and Pierrot Lunaire Book 1 with the Frontiers New Music Ensemble. 5/2/13: OSU Frontiers New Music Ensemble performed Terry Riley's In C as the headlining act of the Rose State College Festival of Modern Music in Midwest City, OK.
4/6/13: The OSU Frontiers New Music Ensemble collaborated with OSU art students and guest painter Yatika Fields in a live painting project in which 10 mural panels were created and inspired by a TWO HOUR live performance of Terry Riley's In C.